Automatically record inbound and outbound calls in Salesforce. Ring.io automatically records both inbound and outbound calls and makes them easily accessible in Salesforce. Store an unlimited amount of calls permenantly in the cloud. Create a library of your best sales calls for coaching purposes. Filter call recordings by call outcome to identify successful calls learn from them. Easily share call recordings with your team with a simple link. Call recordings are an important tool in training your team to deliver the right message over the phone. 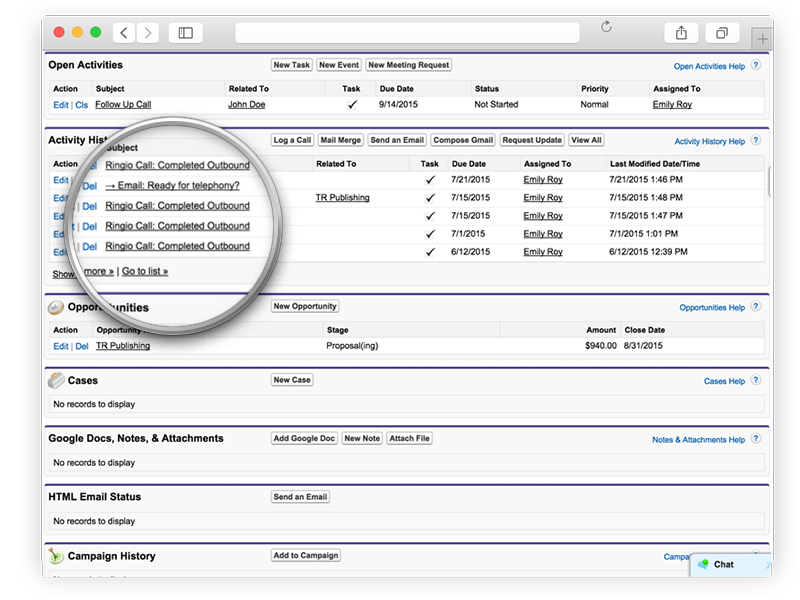 Ring.io records calls and uploads a link to the right Salesforce object so you can filter recordings by lead status, call result, and more. Call recordings give you a complete view into your team's interactions with every lead, so when there's turnover or leads are handed off, you always have a complete record of what's happening with your leads and customers.